It gives me great pleasure to be here once again in Nagaland. The people of the Northeast are known for their rich cultural traditions and their hearty hospitality. I must say that Nagaland in particular best exemplifies these admirable traits and I thank the Government and the people of Nagaland for according me and my family such a warm welcome. The onus is indeed on us, the privileged gathered here today to ensure that Nagaland has its rightful place in our great nation. 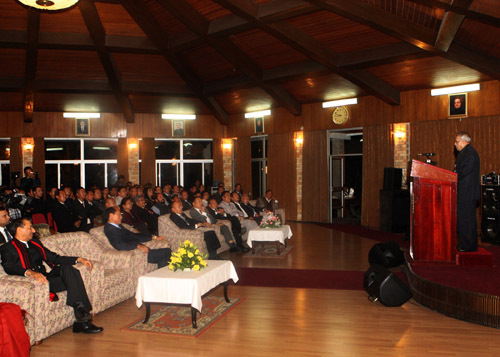 As the state of Nagaland enters the threshold of its 50th Anniversary, it is time for our leaders to introspect. The forthcoming Jubilee year should be one wherein all of us put our minds together, to rededicate ourselves to nation building, to work towards the welfare of the least of our peoples and to reorient our goals to match with those of the nation at large. Fifty years is a long enough time for the state to achieve a clear consciousness and self confidence on itself, to think outwards and to reach out to others. To achieve greater heights, the time for broader thinking and the realigning of our goalposts further out, must be done. The aim for the next fifty years should be for a fully developed Nagaland wherein the young people are able to find here the same avenues as in the rest of the country. But along with this comes the duties and responsibilities of our citizens. To meet these goals and to ensure that Nagaland is an equal and contributing partner to nation-building, the admirable Naga pride must also be matched with hardwork and sacrifice. In this connection, it is essential for the people of Nagaland to seek out a peaceful environment wherein their dreams can be achieved without "fear or favour”. Peace and security are essential to any development and I appeal to all citizens to work towards it. Young people must eschew all forms of violence and to this end I am glad to note that the motto for the State Government is "Peace for Development and Development for Peace”. Two sides of the coin essential for human progress and growth. Coupled with this is the need for the Nagas to reach out to the other states. I am pleased to know that so many young people from the northeast are working so well in the fields of hospitality and IT in many major cities in our country. I call upon the young to also pursue the whole world as your footstool. The "look east policy” of the Government will only be as successful as its citizens want it to be. I urge the citizens of the northeast bordering international borders to actively seek business and industry in our neigbouring countries and be a part of the great Indian diaspora, who are today transforming lives in our country and also the countries that they are naturalized in. I urge you to be global citizens in your work and you must begin with your outlook. Nagaland is rich in natural beauty. Naga people have always been known for their festivals and for their love of music and dance. You have deep respect for your colourful traditions. These are your assets and indeed I am happy to learn that the state government has coined the phrase; "Land of Festivals”, to signify your beautiful land. Certainly, this is an appropriate slogan for a people who greatly merit their feasts. I will indeed go back with fond memories.